The Brother Martin Crusaders placed second for the second consecutive year at the Prep Slam VIII at Holy Innocent's School in Atlanta, GA. The Crusaders decreased the winning team's margin of victory significantly, though. In 2015 Wyoming Seminary outscored the Crusaders by 69 points. This time the margin was only 21.5 points as the Crusaders scored 229 points. Tournament champion Lake Highland Prep. of Orlando, Florida, won the event with 250.5 points. Top-seeded Steven Shields was the 120 lbs. champion and, at 132 lbs., junior Seth Gambill continued what so far has been an exceptional season by winning from a 3rd-seed position. Eight other Crusaders finished in the top-six places. 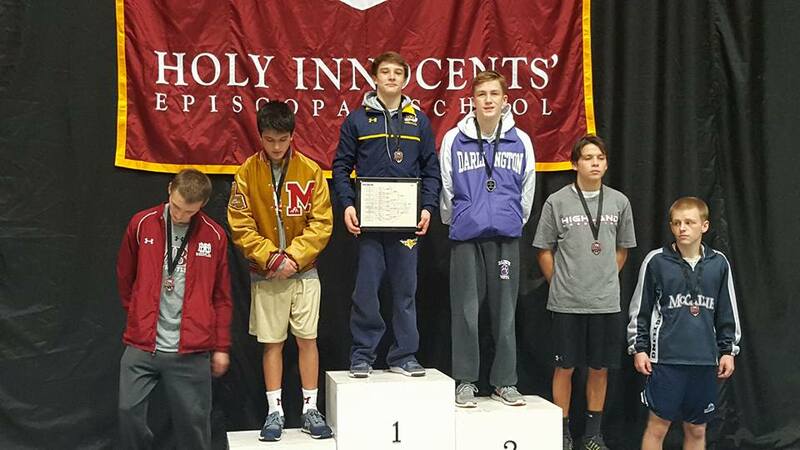 The Brother Martin Crusaders are in a two-team race for the Prep Slam VIII championship at Holy Innocent's School in Atlanta, Georgia. The Crusaders netted 104.5 points on Friday, seven points behind tournament leader Lake Highland Prep of Orlando, Florida. The McCallie School of Chattanooga, Tennessee, is in third place but 24 points behind the Crusaders. Steven Shields, Seth Gambill and Pierce Williams advanced to the finals. Taylor Gambill and Cole Alphonso are waiting for opponents in the consolation semifinals. Luke Cotton, Steven RUmney, Kevin Casey, Brad Guidry, Travis Viener, Jacob Clapp and Mohammed Mohammed are in Cousolation Round IV matches. The Crusaders are in second place with 165 points, Lake Highland Prep has extended their lead over Brother Martin to 26 points with 191.